We were beaten by the snow, winds and icy conditions this week! The good news is that we are open today, Sunday 4 March from 11 am. Warm-up with soup and hot drinks! 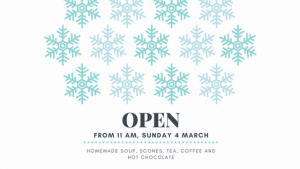 If you’re in the New Abbey area, call in for a warm bowl of homemade soup or a hot drink. We’d love to hear your ‘snow’ stories! We’re open every day, from 10 until 5. Do call in and see us!